"Bringing the Austin Music Map to life." Brought to you by KUTX, MapJam is an all ages, day-long event taking over four different venues around Austin. This uniquely Austin event, which is a sort of choose your own adventure style music festival, is the sister project to the Austin Music Map. The grant-funded map lets users submit videos, photos and tidbits about Austin's music scene using the hashtag #austinmusicmap. The third annual festival begins at the Mexican American Cultural Center before traveling across the highway to the East side. 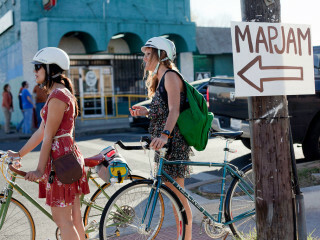 Other stops include the French Legation Museum, Pan Am Park and the Historic Scoot Inn. Participants are encouraged to bike or walk to each destination. Check out our article about MapJam for the full lineup and schedule of performances.